A properly installed new exterior door will save on your energy bills. There are many types of exterior doors on the market today. These include steel, wood, and fiberglass as the most known and popular. Various wood and composite jambs make up most of the available door frames in pre-hung doors. Pre-hung doors mean the door and the frame come as one unit with the weather stripping and hinges intact. So you’ve picked the perfect door, and you are excited about getting it installed. While that is great, the main function of your new entry door is sealing the inside from outside air, rain and snow. If done improperly you will have wind and water leakage into the house, and possibly even rotting of the surrounding framing of the door. Measuring the new and old doors width and height to make sure it will fit. Don’t forget about the jamb depth (door frame) all walls are not created equal. This distance is the wall stud thickness plus interior and exterior sheathing and interior finishes. If possible paint or stain the new door before removing the old. Be honest about your carpentry skills, you will have a big hole in the side of your house for a while. This is not a project to start late in the day. If this isn’t something you feel comfortable with, hire it done. Use a sill pan under the door – this is a water resistant membrane used to keep the sub-floor dry and direct water to the exterior. Caulk the back of the exterior brick-moulding (the outside trim) or the wall perimeter of the opening. Always apply a metal drip cap the top of the door. Use a low expansion door and window spray foam between the door frame and wall studs to keep out air. Have two people strong enough for the installation. Exterior doors can be heavy. Use a long 2-1/2″ screw through the top hinge into the wall framing to help support the door and keep it from sagging over time. The initial step of any exterior door installation is to get the sill perfectly level. If the sill is not level it will be nearly impossible to get the door square with the jamb. Check the floor by laying a level on the floor across the door opening. You may need to shim up one side of the door if it is not perfectly level. Next, install sill protection on the floor where the door sits. Installing some sill protection is a step that got easier with the introduction of sill guards and sill tapes. Covering the floor where the door sits with one of these products will keep out and shed water to the outside. There are many on the market, just pick one that fits your installation best. Caulking the floor and setting the door is no longer an acceptable installation practice. Caulking breaks down over time, and you will be left with a vulnerable point of water entry. Always install house wrap when possible. This is a great water and wind barrier. Cut the wrap to fit inside the opening at the sides. Cut the house wrap at the top of the door on small 45 degree angle. Tape it up out of the way so it is just above the exterior of the door. Always caulk the perimeter of the rough opening behind the brick moulding or nailing flange prior to setting the door. Be sure to slide drip cap under the house wrap. Caulk and tape the angle cuts to keep water from penetrating there. A place that often gets overlooked is the jamb and sill connection. Be sure to caulk this area, water runs down the door jamb and collects at the sill. 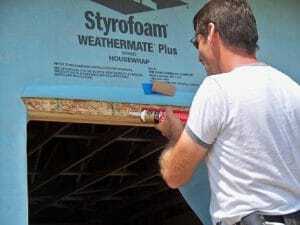 Caulking here will not only increase the life of the jambs, but helps the jambs from rotting. Finish caulking where the brick moulding meets the jamb. Caulking also adds to the energy efficiency of the door. Set the door using instructions recommended by the manufacturer. Let the house wrap down over the drip cap and place caulking in the corners of the angle cuts. Place adhesive building tape over the cuts. Be sure to caulk where the jamb meets the sill and where the jamb meets the brick moulding. These areas often get overlooked and if completed will increase the life span of the door jambs. To see an example with detailed instructions, watch this video guide for applying flashing and installing drip cap on an exterior door installation. You can see the correct method to install drip cap under the house wrap for a leak proof exterior steel door installation. Caulking the brickmoulding to the wall and to the door jamb is a great way to increase the longevity of the door frame. Don’t forget to caulk where the door meets the sill. This area is commonly overlooked. Make your new entry door installation last for years to come.